This post covers how to publish you VMware Application Director (AppDir) 6.x application blueprints to the vCAC 6.x catalog so that users can request them. This post assumes you have a knowledge of AppDir blueprints and have configured AppDir 6.x with a vCAC 6.x cloud provider. Choose the application and create a deployment profile as if you were going to provision the application from AppDir. When you get to "Step 4: Review" you will notice that a "Publish" button is available. 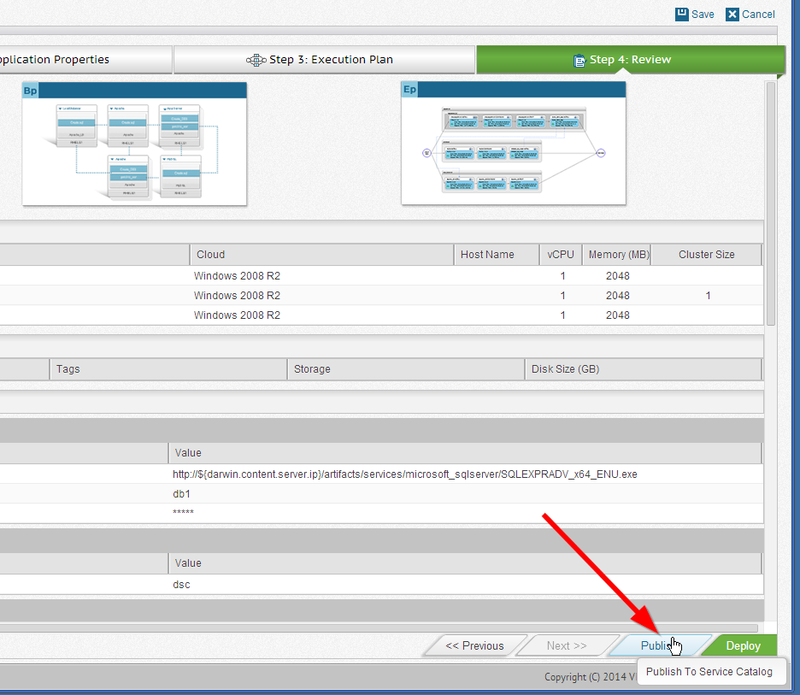 This will allow you to publish the deployment profile to vCAC. 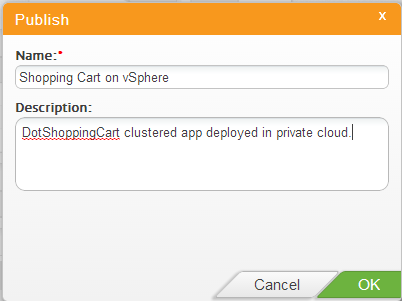 Clicking the "Publish" button will provide you a dialog to set the name and description for the catalog item in vCAC. You may now save the deployment profile, there's no need to deploy. From the vCAC 6.x interface, go to the Administration tab and select Catalog Items. You will see your application there and you can configure it just as you would an IaaS or ASD service blueprint. You probably want to set up another Service type for your applications. Once configured and entitled, you can now request and provision the application from vCAC as well as view application deployment details once it is provisioned. What if the Publish button does not appear on the Review step? Account has application publisher and deployer role. Hi Brian, probably you already found the answer, anyway it can be registered for others looking the same. Asking Application Cloud Administrator role on vCAC for the user publishing AppDir Apps to vCAC. I am able to publish Application Director blueprint to vCAC. But, new request screen is not loading (blank screen) when I try to make a request. Do you have any idea what could be wrong? Is there anyway to debug the issue? Make sure that AppD shows up in the vCAC VAMI (http:ip-of-vcac:5840) as "Registered". You may need to restart AppD if it isn't. You can also tail -f the /var/log/vcac/catalina.out on the vCAV appliance while you attempt to request that blueprint to see if there are any errors. In the application blueprint, if the property has the "Overridable in Deployment" option checked, then it will appear during the vCAC catalog request. If you don't want the user to view or change the option, just deselect that option.